i liked the article it is just very beautiful. you have have used a good sequence n also the comparison is good. I really appreciate the above article since it shows how organic farming contribute to the environment and to humans. 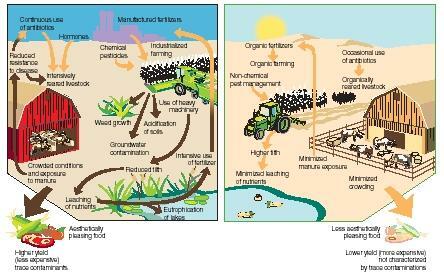 Ilike also the illustration shown above comparing the intensively managed agriculture and with organic farming. I do hope that our farmers will adapt the new technology which is the organic farming to have an organic produce. Looking back from soil-dependent agriculture which is no application of ameliorants or fertilizer to a fertilizer-dependent agriculture which is the application of manufactured inorganic fertilizer to organic fertilizer agriculture that some of our investors and growers need to sustain especially the investors from Japan or neighboring countries. I hope I can have a clear copy of this illustration. I hope you will accept my short message. i liked simplicity of d article yet filled with eye-opening basic comparative information about organic & conventional farming.i m sure environment lovers from any field will like this article. It is very good for human and environmental conservation. By the way, can i get this article and the illustration? If i can, pls send it to my mail. I NEED MORE INFORMATION ABOUT SOIL CONDI.TION IN ORGANIC FARMING.ofcource with reference. mation about soil condition in organic farming. This information is really useful for agriculture.